– a welcome and refreshing start for entry into a hot climate, and one that would set the expectations for what was to come. As we were driving through the Costa Rican landscape heading toward the property (an approximate 30 minute trip from the airport), we were surprised when a video screen lit up and we were greeted for check-in via Skype. This was just one in a long line of innovative luxuries and one that made it possible to head directly to our room upon arrival. The rolling grounds of Four Seasons at Peninsula Papagayo embrace you from the moment you arrive. The setting is clearly designed to be a true haven — an unparalleled place to unwind, be pampered and forget about everyday life. The peninsula covers 2,300 acres and has 15 miles of coastline with some of the country’s most beautiful golden sand beaches, two of which frame the resort. 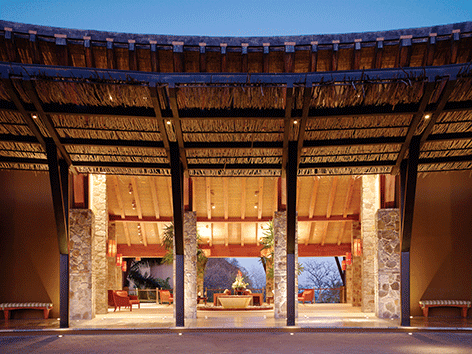 When building the hotel, renowned local architect Ronald Zurcher looked to the land, as well as its past. Although Costa Rica only covers 0.03 percent of the surface of the globe, it proudly shelters five percent of the existing biodiversity of the entire world. 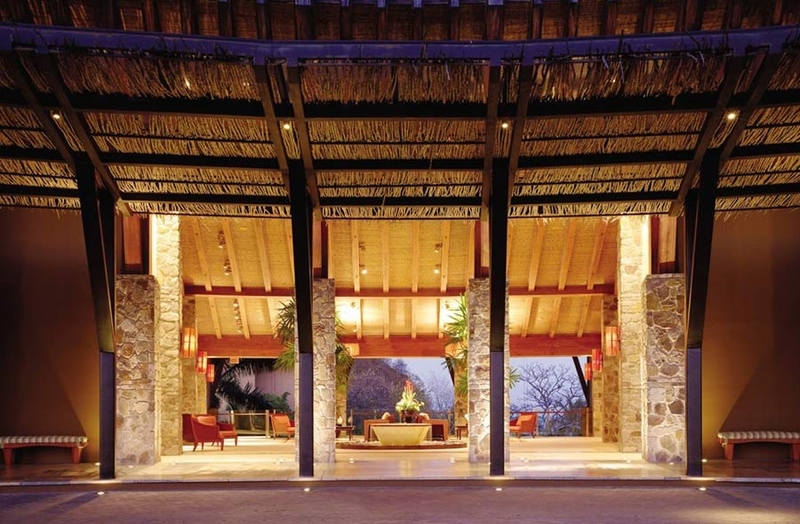 With this in mind, he created a resort that looks as though Mother Nature herself carved it from the jungle. 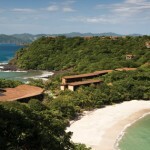 The shapes and textures of all of the guest rooms and public buildings are those of leatherback sea turtles, armadillos, iguanas, butterflies and birds cascading down a hillside. This passion for being one with nature is at the core of everything that you will find on this exquisite piece of land. 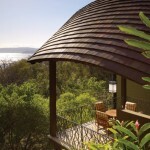 Upon arrival at our “Canopy Plunge Pool Suite,” we were overwhelmed by the stunning view that awaited us. 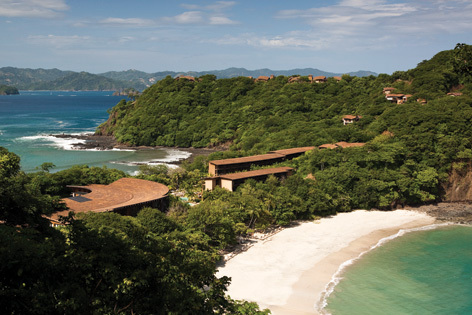 At over 1,200 square feet, these secluded hillside suites represent Four Seasons opulence at its finest. 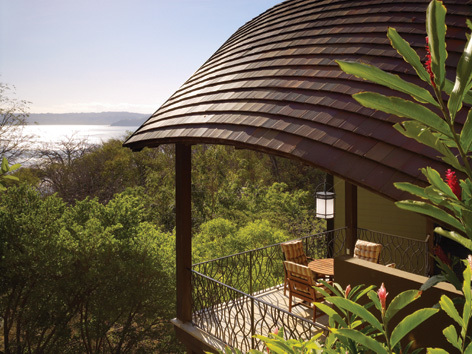 The breathtaking natural beauty of the jungle canopy and pristine coast below are easily taken in from all areas of the suite, as well as from the spacious patio, which is complete with dining table, chaise lounges and a welcoming infinity plunge pool. To jump right into relaxation mode, we headed to the spa which features serene treatment rooms and a world class array of holistic relaxation choices including Rainforest Aromatherapy Massage, Organic Costa Rican Coffee Scrub and Volcanic Mud Wrap – this is how to unwind! Fortified from our trip to the spa, we headed off for what would prove to be a terrific lunch at Papagayo, which sits poolside and is one of the more casual restaurant choices. It seems that food is becoming more and more important in travel, and Four Seasons has firmly grabbed the handle on this trend. In fact, several times a week, local fishermen arrive right on the beach to offer their bounty to the resort’s culinary team. 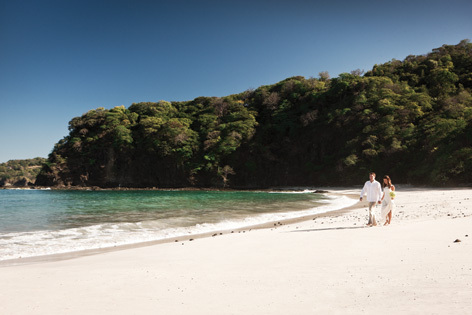 The waters off of this part of Costa Rica are teeming with epicurean jewels and the guests are encouraged to join in the ritual of making selections, custom-designing their dining experience in one of the four outstanding restaurants on the property. Appropriately, the chefs make a note of the time and place of the dinner reservation before getting down to the details of the guest’s preference in the method of preparation and suggestions for the perfect accompaniments to the meal. When paired with a sommelier’s selection from the extensive wine list, you are surely in for a memorable experience. Want more? 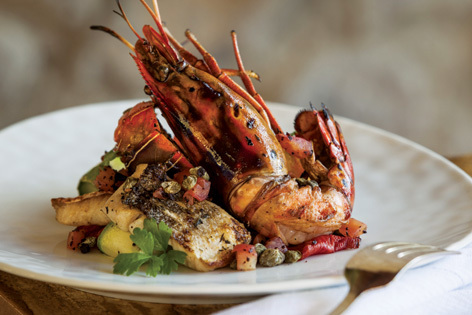 The Italian fare at Di Mare restaurant was beautifully highlighted at the Chef’s Table. 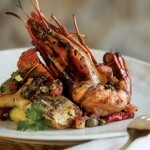 This is a dining experience that places you right in the middle of the action, at an elevated table in the kitchen, as you gain a unique perspective while a team of culinary professionals deliver a course-by-course savory extravaganza. 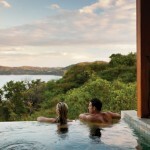 Four Seasons at Peninsula Papagayo is by no means a “one trick pony,” and their culinary program is just the beginning. 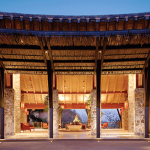 This resort also highlights a spectacular golf course which was developed in the same eco-sensitive manner as the rest of the property. There was careful consideration for all of the local flora and fauna, leading Audubon International to certify this course as an Audubon Cooperative Sanctuary – a place where endangered birds, monkeys, iguanas and butterflies thrive amid more than 25 species of giant trees – truly beautiful. This lush green course that winds along the “Trail of Giants,” boasts a special breed of seashore paspalum grass which also does its part for the environment by relying on abundantly-available salt water for nourishment. Add rolling hills that capture incredible views of both sides of the peninsula and you have a splendid, environmentally-friendly place to tee up. After a leisurely few hours on the links, it should come as no surprise that just off of the 18th hole, the notable culinary experiences continue with the Garden Experience at Caracol, the resort’s steakhouse. Your private table is beautifully situated in the middle of a charming herb and vegetable garden and much of your customized meal is highlighted by components which are grown within ten feet of where you are sitting. 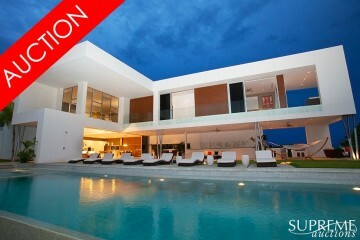 This extensive property has a tremendous amount to offer and is adorned with multiple pools, beautiful beaches and as much or as little activity as you require. Want to burn off some energy? Head off for a surfing class or check out the two-level fitness center which incorporates a range of cardio machines equipped with TVs and iPod docking stations. Not your cup of tea? How about grabbing a cappuccino at the on-site coffee shop? There is always the option of the popular chocolate-making workshop or a class in mixology. 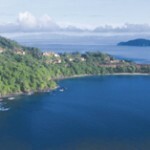 If you want to head off property, there are numerous activities and adventures available like ziplining or taking an exciting hike up the face of a volcano – there is truly something for everyone. 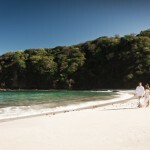 Situated amidst a tropical forest, the resort is the crown jewel of a gorgeous swath of land jutting into the Pacific. The Four Seasons not only consistently raises the bar on luxury here, but sets a very high standard for architectural integrity. 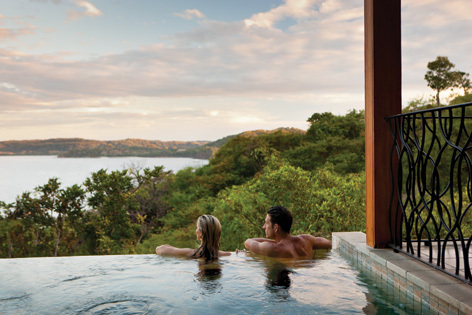 With first-rate service and unparalleled hospitality, Four Seasons at Peninsula Papagayo was an experience that will be very fondly remembered and one that is highly recommended.